I don't usually share my weekly round ups on a Monday but due to having the busiest weekend going, I have no choice but to share my weekly round up with you today instead of yesterday; I hope you don't mind! However, my Motivational Monday will still be going live but later on today, so not only do you have one post but you have two! 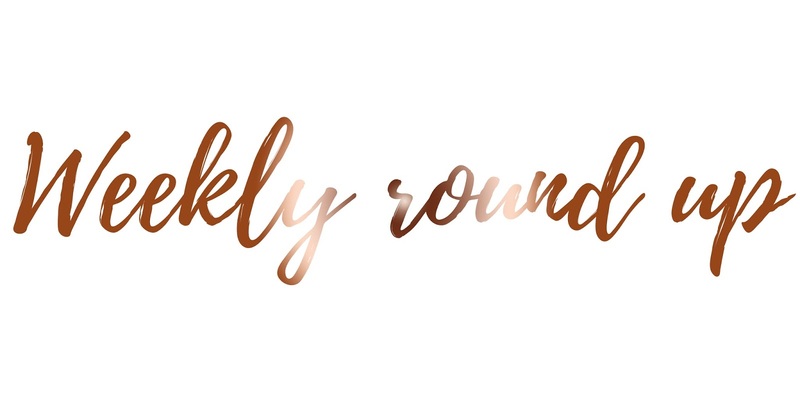 I really wanted to share my weekly round up with you this week because so much has gone on, I haven't had the time to just sit back and relax which I definitely love to do. This weekend I was on my training courses for my new job which I'll be starting this time in three weeks; it's gone so quickly! I remember applying for the job back in November and now it's just around the corner. On Saturday I had a quick drive to Chelmsford (I know there are a fair few bloggers in Chelmsford too), where I had to attend an assessment day where everyone who went would be assessed to see whether or not they were good enough for the job. Not only did we have to sit in the sun all day, but we also had to run around in it; not fun! I feel sorry for children who have to do PE in it now; I forgot how horrible it is. I have to say I was absolutely dreading the weekend and I didn't want to go as I'm not very confident when it comes to going to somewhere completely on my own, to then meet a heck load of people who I don't know.. I tend to sit back and hope someone says hello but I met so many lovely people and my lack of confidence didn't effect the day. On Sunday I had another quick drive but this time I went to Upminster, some where I haven't been before. This was also the first time I had driven on the M11 and the M25 completely on my own without someone sat next to me; it all went completely fine which I was so relieved by. On Saturday evening I was so tired which meant I was also grumpy; I really did not want to attend my training day on Sunday but if I did, I would get paid more so of course I did attend in the end. Yesterday was based on inflatables training; so we sat in a classroom for 2 hours altogether where we learnt the theory side of inflatables and we then had an exam; it was easy but god I was so tired. I was making the whole class yawn. We then went outside to be shown how to put up inflatables, now if you don't know what I mean by inflatables. I mean bouncy castles and things which you'll find at fair grounds. For instance, the bull ride which is inflatable or the ride where you hit people off a pole; it's great fun. Once we were shown how to do it, we had to work as a team to put up and also put down the inflatables in the correct way. It's crazy how a bunch of strangers can come together and work as a team but people you've known forever bloody struggle with this! Although I was absolutely dreading my weekend training, I came away not only hopefully being in a job in three weeks time which I've never done before, but I've also come away fully trained in putting up and taking down bouncy castles and other inflatables. It's not exactly something which everyone can say they can do; I love it! I met so many wonderful people and it just shows that when you leave your comfort zone, it's crazy what the results may be. If you're interested in a post based fully on lack of confidence and meeting new people for the first time; please let me know!